NEW this year - Skip the Line! In a hurry for class or craving an at-home comfort meal? Grab a hot and ready meal on the go. Never get tired of the same meal with features changing daily. Available all day long for your convenience! Thai Express features freshly cooked authentic Thai flavours. A favourite amongst our guests! The Grill features your favorite pub-style foods; burgers, chicken strips, poutine and more! On the Go provides a great selection of sandwiches, salads, parfaits and break boxes. Whether you're looking for a complete meal or just a snack, we have a great variety to choose from. All items made fresh, on-site daily! Fairtrade Electric City Coffee, Fairtrade Numi Tea, Soup, Baked Goods and Snack selections round out the daily offerings. Proudly serving Fairtrade Electric City Coffee and Fairtrade Numi Tea, On the Go salads, sandwiches and parfaits, beverages and snack foods. Home-style prepared soup and Pizza Pizza slices are available daily! NEW THIS YEAR- Cold Brew Electric City coffee! Proudly serving Fairtrade Electric City Coffee, Fairtrade Numi Tea, beverages, bakery items and pastries. On the Go provides you with salads, sandwiches, parfaits, break boxes, fruit and sushi. *Following feedback from the Foodservices Advisory Committee, Electric City Café will now open at 7:30am Monday-Friday to accommodate morning classes! 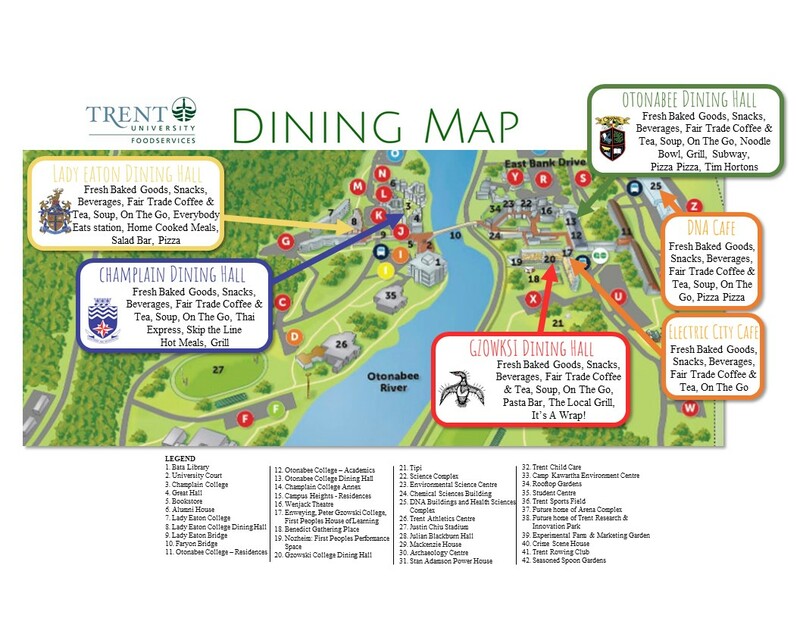 Gzowski Dining Hall offers the diner a more intimate setting with smaller tables, custom meals, and priority service. Check out the new dining hall! NEW! Try the new Gourmet Personal Naan Pizzas available daily at the It's A Wrap! station. Choose from Greek, Caesar, Canadian, Pesto, create-your-own! It's A Wrap! featuring create-your-own salads, wraps, pitas and pita bakes! The possibilities are endless. The LOCAL Grill features local Yorkshire Valley chicken, Empire cheese & Sticklings breads. Try out their unique menu and support local! Build-your-own pasta dish at The Pasta Bar! On the Go selections of salads, sandwiches, and parfaits, Fairtrade Electric City Coffee, Fairtrade Numi Tea, beverages and snacks are all available here daily. Gzowski College dining hall became ‘green certified’ in October 2018 for its ongoing sustainability & environmental efforts! NEW THIS YEAR- EVERYBODY EATS featuring vegan, vegetarian, made-without-gluten and Halal-friendly meals! Everybody can enjoy the daily offerings: Lunch- Build your sandwich & daily features and Dinner- Build your meal daily features. Daily Kitchen features, Soup, Salad Bar, Pizza, On the Go, Fairtrade Electric City coffee and Fairtrade Numi tea will ensure you find something you can't wait to eat! Beverage, bakery and snack items are also available. Lady Eaton College dining hall became ‘green certified’ in February 2019 for its ongoing sustainability & environmental efforts! The Noodle Bowl lets you create-your-own Asian-inspired bowl. Choose your own fresh veggies, protein, noodles and broth. Yum! Subway serves up sandwiches, wraps and salads prepared to order by our Sandwich Artists. On the Go featuring a great new selection of sandwiches, salads, parfaits and break boxes, including sushi. Whether you're looking for a complete meal or just a snack, we have a great variety to choose from. Complete nutritionals are on the packaging. The Grill is your made-to-order grill station serving up burgers, chicken fingers, wraps and breakfast. The Soup Station features two soups daily. Try our daily made-in-house vegan, dairy-free, made-without-gluten soup! Pizza Pizza, fresh-made Bakery items, Fairtrade Electric City Coffee, Fairtrade Numi Tea, Beverages and Snacks round out the food experience here.